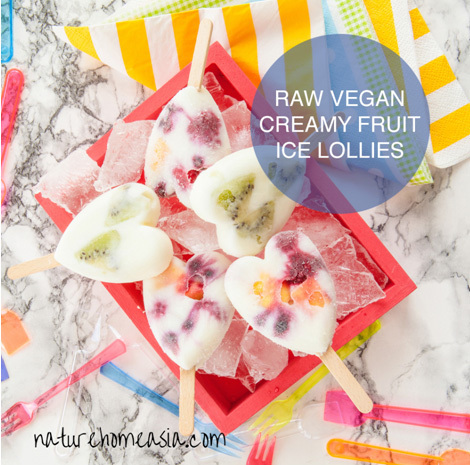 As the temperature heats up most of us reach for ice cream, sodas and ice lollies to cool us down and give us a sweet fruity treat. Unfortunately most are packed with sugar, additives and unhealthy ingredients so here’s a great recipe from Nature Home Asia that you and your kids will love. Nature Home Asia’s mission is to provide you with the best quality ingredients to help and inspire you and your family to live a healthier lifestyle – so we have come up with a healthy version of a creamy ice lolly that’s not only white sugar, additive and dairy free it’s also completely raw and made with fruit so packed with vitamins and extra healthy! If you can’t eat nuts or you want to lower the fat content, you can replace the cashews with tahini or frozen banana. The recipe is really quick and easy too, perfect for mums on the go! Fresh fruit to decorate like kiwi, banana, strawberries and mango. Place all the ingredients apart from the fruit in a high speed blender and blend until smooth. Scrape the sides and blend again until really creamy. Chop the fruit into small pieces to go into the moulds. Prepare your ice lolly moulds by placing some fruit in them and have your lollipops ready. Pour in half of the mixture into each mould then add some more fruit and then fill the rest of the mould until 3cm from the top and put in the lollipop sticks in the centre of the moulds. Place immediately in the freezer and freeze overnight or for at least 8 hours then enjoy! For all natural ingredients and quality superfoods delivered to your door www.naturehomeasia.com are the only Samui based purveyor of premium products that are stored in a temperature controlled unit – 100% freshness guaranteed.